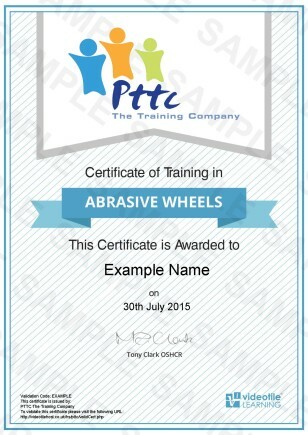 This on-line Abrasive Wheels Training Course from PTTC E Learning is aimed at anyone who uses abrasive wheels, or employs people who use abrasive wheels as part of their work. Who Is This Abrasive Wheels Training Course For? Why Do You Need Abrasive Wheels Training? This Abrasive Wheels Training Course covers the anatomy of an abrasive wheel, the dangers associated with their use, Storage and handling and much more. 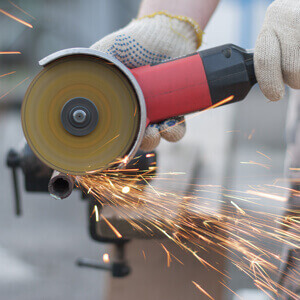 The use of Abrasive Wheel equipment carries certain hazards, and requires particular care and consideration when using this form of equipment. Hazards can include wheel bursting, contact or entanglement with running wheel, even physical injury from component being ground, the noise and also inhalation of dust or particles. There is also an inherent risk of breakage in every abrasive wheel. This course is designed not just to keep you compliant with regulations, it’s more importantly to help protect those that use this form of equipment in the workplace. The statistics sadly show that nearly half of all accidents that involve abrasive wheels are due to an unsafe system of work and operator error. So Stay Safe, and Stay Compliant with our fully accredited and certified with our On-Line E Learning Abrasive Wheel Training Course, in the world of safety its always better to be safer than to be sorry! Our Fully Accredited and Industry Approved On-line Abrasive Wheels Training Course is aimed at anyone that may come into contact with Abrasive Wheels within their day to day duties at work. What is an Abrasive Wheel, and where might you come into contact with them. What is the make up of Abrasive Wheels. The Dangers of Abrasive Wheels. Safe speed considerations with Abrasive Wheels. What markings you may see on wheels, and what they mean. How to safely store and handle Abrasive Wheels. How to safely check and test Abrasive Wheels. Why you need training and certification for using Abrasive Wheels. When and how to safely and correctly inspect Abrasive Wheels. Looking at what you have learned and how to implement it. By learning on line with us at PTTC e-learning, the main outcome of this training course is to provide you or your team members with an effective form training, that meets every day budgets while delivering a recognised qualification, and the knowledge and awareness to safely use Abrasive Wheels in the workplace. Once you or your team members have successfully completed the course by watching the video, and answering the questions they can simply download the certificate. So there is no time off work required to attend a training course, plus the expense of travel there and back, no dirty or hot class rooms and you get to download the certificate as soon as you have completed the course. This course can be completed in the time it takes to watch an average movie, so what have you go to lose? This Course Is Fully Approved By CPD. If you are not sure if our Abrasive Wheels Training Course is the right course for you, or if you’re a bit dubious as to the quality of our training course will be what you’re expecting why not try one module of the course of your choice inc the assessment FOR FREE . This will give you a free chance to experience hands on our on-line learning environment. To get a Free Trial Just click on the ‘Free Trial Logo & follow the video instructions to access the online learning area. Once you have trialled the module you will then be given the option to purchase & continue with your course! Why Not Share This Course! Our On-Line Abrasive Wheels Training Course has 100 minutes of video to watch, and 55 questions to answer. We estimate that the course should take you no more than 2 hours to complete. If you want to do it over a number of days then that’s fine, the system will remember where you left off and you can go back to it at exactly that point. The simple answer to this is yes, our Abrasive Wheels Training Course is, the course is Certified and accredited by ROSPA (Royal Society for the Prevention of Accidents) and iirsm (International Institute of Risk & Safety Management) so you can rest assured that this course will meet your needs if you are looking for a competent introduction to the Abrasive Wheels Training Course. There no problem with that, with our system you get 3 chances as standard to take and successfully pass the Abrasive Wheels Training Course. If you are still unsuccessful at that stage, then just drop us a line and we will provide you with 3 further attempts free of charge. Once you have watched the 33 video lessons and successfully answered the 55 questions, gaining a average 75% average pass rate you can then simply download and print off your Certified CPD & and iirsm (International Institute of Risk & Safety Management) Abrasive Wheels Training Course certificate. This type of training gives lifelong knowledge & skill, however there a legal requirement to refresh the Abrasive Wheels Training Course. It is recommended that this training is refreshed at least every 12 months, however like any skill or knowledge we learn memories fade over time especially if we don’t use those skills. So, you can always come back again if you wanted to and refresh your skills and update your knowledge by purchasing and completing the course again. That’s easy as well. You can pay for your Abrasive Wheels Training Course online with your credit card, debit card, or PayPal. However sadly we no longer accept cheques, sheep, horses, or gold.